Vijay’s 50th film has turned out to be a big disappointment and the actor has added one more flop in the series of “Kuruvi”, “Villu” and “Vettaikkaran”. In the film, Sura (Vijay) makes a very dramatic entry – he jumps out of the sea (what else you can expect after naming the film Suraa, which means shark) and the whole fishing hamlet was tensely waiting for the safe return of their favourite ’son-of-the-soil’ and ‘darling of the people’. Since we are used to such dramatic entries of Tamil heroes, we ignore the gimmick and look forward to the film. The story is nothing but Sura’s heroics to save the fishermen from the clutches of a money-hungry minister who wants to take the entire hamlet for his own good. Sura, who is on a mission to save his people, somehow finds time to sing and dance with Tamannaah in spectacular locations. Tamannaah has no job in the film other than adding glamour. Vadivelu provides some comic relief. We have no objections to seeing the old story of saving people from greedy and powerful politician. But director S.P. Raajkumar has failed to narrate the story in an interesting manner. If the plot is old, the treatment is older. 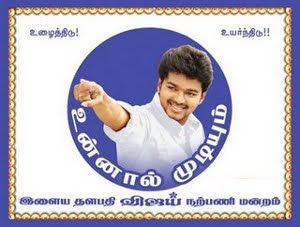 He has made fruitless efforts to cash in on Vijay’s popularity. The director and the hero must understand that stardom is useful in fetching the crowd on the opening day, but you need a good script to sustain the interest. Vijay dances well and breathes fire in incredible fighting sequences. But he hasn’t improved on serious dialogue delivery – the so-called punchy dialogues sounds childish. Dev Gill, the villain, is out of place in a poorly etched role. Mani Sharma’s numbers are foot-tapping, but they remind us of some Telugu hit songs. Cinematography is good. “Sura” may just fail to swim through the tide.